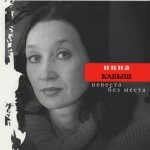 Inna Kabysh (b. 1963) is the author of seven books of poetry, including: Lichnye trudnosti (1994), Detsky mir (1996), Mesto vstrechi (2000), Detstvo, otrochestvo, detstvo (2003), Nevesta bez mesta (2008), and Mama myla ramu (2013). In 1996 Kabysh was awarded the Pushkin Prize by the Alfred Toepfer Fund (Germany); she has also won the Anton Delwig Prize (2005), the “Moskovskiy schet” Prize (2014), and the “Deti Ra” and Anna Akhmatova prizes (2016). Since first encountering Kabysh’s writing in the 1990s, KATHERINE E. YOUNG has been working to bring Kabysh’s artistry to English-language readers; Kabysh’s poems have been published in Young’s translations in numerous print journals and online. In 2016 a full-length manuscript of Kabysh’s poems in Young’s translation, Cat and Mouse, was named a finalist for the Cliff Becker Book Prize in Translation. Now available from Toad Press: Blue Birds and Red Horses, a new chapbook of Inna Kabysh’s poems translated by Katherine E. Young. The chapbook contains poems from Inna Kabysh’s acclaimed second full collection, Detsky mir (Children’s World), including “Cat and Mouse” and “Shine On, Shine On, My Star” (Trafika Europe) and “Children’s Resurrection Day” (South Florida Poetry Journal). Click here to see Pavel Golovkin’s film version of “Shine On, Shine On, My Star.” Blue Birds and Red Horses was named Washington Independent Review of Books’ “Best Translation” for December 2018. These are not simply poems. They are the heart of Russia in verse. Two Poems by Inna Kabysh translated by Katherine E. Young, a dual-language edition of Kabysh’s poetry for the iPad that includes text and audio versions of the poems in both Russian and English, as well as video interpretations of the poems, was published in 2014 by Artist’s Proof Editions and is available on iTunes. More information about this project is available in Katherine E. Young’s article “Unstapling the Poem from the Page: Translating Inna Kabysh for the iPad” in Translation Review. In 2015, Two Poems was added to the born-digital materials teaching collection of Rare Book School at the University of Virginia. Cover image of Two Poems (c)Александр Сенников, Alexandr Sennikov. Image used with permission.